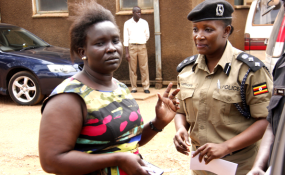 CIID Director Grace Akullo (L) talks to deputy police spokesperson Polly Namaye at CIID headquarters in Kibuli (file photo). Kampala — Ms Grace Akullo, the director of the Criminal Investigations Department (CID), has been sued for the alleged continued illegal detention of the Kyadondo East MP, Mr Robert Kyagulanyi, aka Bobi Wine's bodyguard. Mr Edward Ssebuufu, alias Eddie Mutwe, through his lawyers of Kiiza & Mugisha Advocates, filed an application before the High Court in Kampala on Friday seeking his unconditional release since he has been detained beyond the constitutionally permitted 48 hours. Also sued alongside with Ms Akullo are; D/SCP Elly Womanya, the officer-in-charge of criminal investigations at CID Kibuli, SP Eliao Moses, the DPC of Jinja Road Station, and the Attorney General. "A declaration that the acts of the respondents (Ms Akullo and group) of detaining the applicant (Mutwe) beyond the constitutionally permitted 48 hours, since August 25, 2018 is an infringement of his 1995 Uganda Constitution fundamental human rights and freedoms to personal liberty, dignity and just administration," the court documents read in part. Mutwe also wants Ms Akullo and her group to jointly pay him general damages for the illegal detention that he says has amounted to psychological and mental torture. According to court documents that this newspaper has seen, Mutwe was picked by security on August 25 from Semakokiro Plaza in Kamwokya in Kampala and he was later detained at Chieftaincy of Military Intelligence (CMI) headquarters in Mbuya. He was then transferred to police detention centre on August 31 allegedly under the instructions of Ms Akullo and others. On August 30, Justice Musa Sekaana of the High Court in Kampala, issued an order, directing the military and the Attorney General to produce Mutwe before court "dead" or "alive" on September 4. "The said order was ignored by the respondents (Ms Akullo and group) and the 2nd respondent (Mr Womanya), had the audacity to deceive court on September 4, that the applicant (Mutwe) was due for transfer to Gulu Magistrates' Court for appearance," the suit states. "At the time of filing this suit, the applicant (Mutwe) is detained at Jinja Road Police Station under the authority, control, direction and supervision of the 1st, 2nd and 3rd respondents," it adds. The State had last week told justice Sekaana that Mutwe was scheduled to appear before the Gulu court to also be charged with treason. If he had been charged, he would have joined the list of 33 other suspects who include his boss, Mr Kyagulanyi, who have since been charged with similar charges over the chaotic Arua by-elections mid last month. By press time yesterday, the court had not yet set a date to hear this application.